I was riding the bus the other day when I overheard a conversation about the mysteries and wonders of pyramids. I hadn’t thought about pyramids in a while. Don’t even remember the last time I did. They’ve faded quite far into the background noise of insane and stupid things that fill the popular discourse. The bus conversation started triggering old memories. Pyramids have a special significance to me. They were my introduction to the world of pseudo scientific mumbo jumbo. What a thorough introduction it was! I must have been 11 or 12 at the time. Someone lent me a copy of a book, the name of which I have long forgotten (I do remember Erich von Daniken was referenced repeatedly), on all one could possibly want to know or do with pyramids. Everything, from conspiracy material on the decapitated pyramid of the Great Seal of the USA to sharpening of the razors to connections with Reich’s Orgone energy to effects on Kirilan Photography and much much more. I remember all this because I actually tried to verify some of the claims. Pyramids appeared in my life around the same time science did. I was really beginning to get into it in school, all that stuff about experimentation and verification. A few dozen cardboard pyramids, multiple expeditions to secretly swap blades in dad’s shaving set (I wonder if that’s why he switched to electric soon thereafter), and crystals and pendulums and months of my life later, my efforts yielded no discernible evidence. I blamed it on the inefficacy of my preteen scientific skills, and shelved the book. But so much for nostalgia, let us return to the bus conversation that started this blog entry. One of the key elements of the conversation had to do with the mystery of the similarities between the Egyptian and the Meso-American pyramids. Thousand’s of miles apart with a huge ocean in between, how can it be that the two independent civilizations produced such similar structures. I think that is Von Daniken’s argument. Civilization seeding space aliens (or Predators actually) are just around the corner, although in the particular conversation they were never explicitly mentioned. Somewhere in the back of my mind I heard the tune from the Outer Limits playing faintly. I wish I had it on my phone, I would have played it out loud. Or perhaps I should have barged in on their conversation, and told them about another mystery surrounding the pyramids that they are probably unaware of. At the time I ran into that book I mentioned above I was in Nigeria, back when the Naira was worth a lot more than it is now. 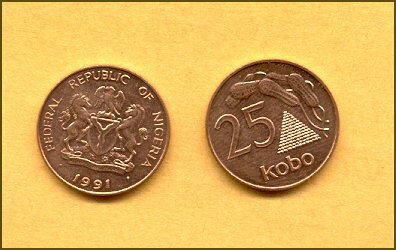 My allowance consisted of two 25 kobo coins. Each coin has the picture of a small triangle, which is actually a pyramid. A peanut pyramid to be exact. First a little lesson in history. We learned about the Peanut Pyramids (aka Groundnut Pyramids) in elementary school. They are now artefacts of a bygone era, from a time when the country actually produced agricultural goods in significant quantities. Peanuts, or groundnuts as they are known there, are farmed in the north of the country. All the export facilities are in the south, where the ports are. The transport system has always been abbysmally inadequate, even back then when the trains worked. The farmers of the north would produce more peanuts than could be transported to the ports within the harvest season, so a massive warehousing problem emerged. Someone came up with the ingenious idea of simply stacking sacks of peanuts outdoor, since harvest time is dry anyway. In the shape of pyramids. Pictures of the pyramids, especially ones giving an idea of the scale are quite hard to come by on the net. I found an article in Britannica that had reference to them. The best I could find for posting here is the image on the back of a 1 Naira note. Appearance of pyramids has a tendency to invoke mysteries, wonders, allegations and speculations from the new-age inclined. No reason the same don’t apply to Nigerian pyramids. How did they build them? Why did they build them? Why are they aligned (take note of the pyramids in the background in the picture on the Naira note)? Why the same shape as in Egypt and South America? Space Aliens!? If I had the chance to talk to my fellow bus riders, I would ask them to Imagine building a multi-story tall stack of peanut bags. There are no cranes, no pulleys, no scafolding, no mechanical aids of any kind. Nothing but manual labor, just like in ancient Egypt and Meso America. They would have to start from the bottom, and build their way up. They could use a ladder I suppose, but they should think about the implications first. A ladder isn’t that hard to build, still it isn’t free. The cost would add up since multiple ladders will be needed. Climbing a ladder takes time, so the operation will slow down considerably. And, the accident rate will increase too. Given all these constraints, what stacking shape would they use? This entry was posted on September 29, 2008 at 9:59 pm and is filed under Skepticism with tags Nigeria, Nigerian Groundnut Pyramids, Pyramids. You can follow any responses to this entry through the RSS 2.0 feed. You can leave a response, or trackback from your own site. Why don’t you even have a picture of the famous nigeria’s kano groundnut pyramids of the 70? It makes a story more authentic. Send me a link. Thanks.